Venture Resorts offers guests up to 50% off cabin rentals for August 25-27. 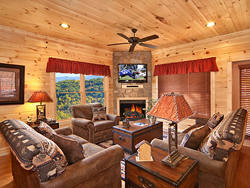 Venture Resorts (https://www.cabinsofpigeonforge.com), Pigeon Forge's largest luxury cabin rental agency, has announced a special last minute travel deal for the August 25-27 weekend. Guest can save up to 50% off all of the company’s remaining cabins. With this weekend’s special, a two-bedroom cabin like the company’s “Honey Bear Retreat” is available for just $115 per night, after discount. A three-bedroom Pigeon Forge cabin like “Cherokee Peak” is available for just $173 per night, after discount. "All of our properties are cabins," say Parris, "But they’re really luxury log homes." Parrish says modern travelers want all the comforts of home on their vacation, especially when they travel with children. Cabins range in size from one-bedroom retreats to twelve bedrooms. "You still get a porch with a rocking chair and great views of the Smokies," Parrish says. "But that doesn't mean you're roughing it." Cabin rates are subject to availability. The cabins cited above are available at the time of writing, but may be booked by press time. Guests can visit the company's web site to see rates for all currently available cabins, with discounts applied at the time of booking. For more information, visit https://www.cabinsofpigeonforge.com/specials.php. Venture Resorts is the largest luxury cabin rental agency in the Smoky Mountains, managing over 400 cabins within minutes of Great Smoky Mountain National Park and family-friendly attractions in Gatlinburg and Pigeon Forge, Tennessee. For more information, call (866) 347-6659 or visit one of the company’s web sites https://www.cabinsofthesmokymountains.com or https://www.cabinsofpigeonforge.com.